School was out this past Friday. My son is so happy. The summer stretches out before him and he sees a driver’s license, the beach, lots of basketball, cook-outs and girls who think he’s cute. I see that it’s time for him to get a job. Play time, at least unlimited play time, is over. Actually, that sounds gloomier than I intend. I believe in play. I love play. I try to play as much as I can, as a matter of fact. I don’t think we ever outgrow it. I strongly believe that the ability to be creative and the ability to be playful are closely related. That’s one reason that I’ve started doing “Playshops” at schools, conferences and education centers around the country. For so many little children the pressure to succeed in academics is pushing away the opportunity for creative play. Kids learn through play. For that matter, adults learn through play too! For children, just being allowed to interact in their environment and satisfy their natural curiousity is a learning opportunity. For adults, just letting go of expectations and allowing ourselves to experience places, materials and others is also a learning experience. Okay, I’m getting a little lectur-y here. Didn’t mean too. It’s just that I’ve met so many grown ups who’ve forgotten how to paint with their fingers, or wear a bright pattern or try something new. Little people do that naturally. So, okay Simeon, I do want you to play this summer. Meet new girls, get sand in your shoes, laugh ’till you cry and drive SAFELY AND WITH A SEAT BELT. But get a job, too, okay? 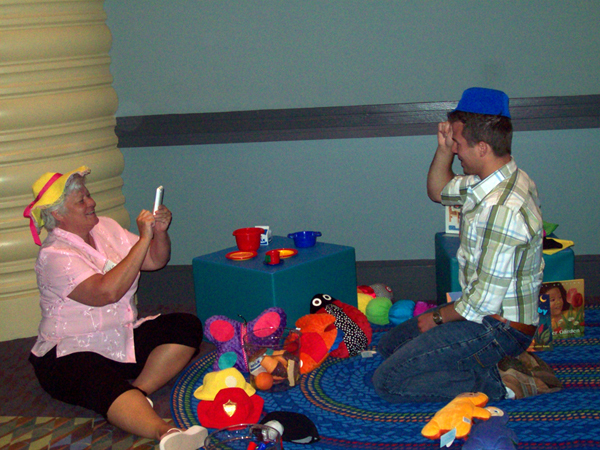 About the pics: The adults playing are at a Head Start Play-Shop in May. 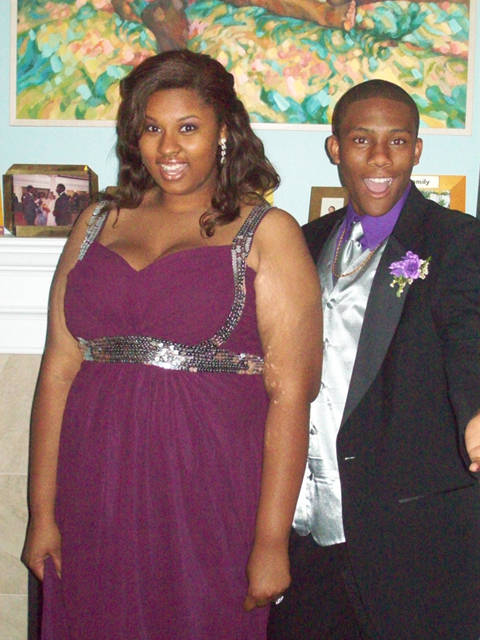 The other pic is Sim and his friend and “Play Sis” Jessica before the prom. Natlie I was in your class today. I was the facilitator. I was wondering if you could email me Erica Lawson’s email address I never got it and I want to email her. We were talking about this stuff she uses in her hair that I would like to buy for my dauther. My email address is cdatre@aol.com. I would really appreciate it if you can give that to me. If you want to email her and ask her first that would be fine. Thanks for the class today it was excellent. I learned a lot of new things that I will be using in my classroom next year. Hey Carla, Thanks for facilitating our workshop! I’m currently in Washington D.C. at the Early Headstart conference and won’t be back in Beaufort until the weekend. Sorry for the delay, but I’ll get you that info as soon as I can. Love and relate to this so much…funny……………Only Mom’s have a clue…………..
What a blessing to find your blog! Gullah Gullah Island has a very special place in my heart as my 16 y/o son watched many years ago and now my two little girls 5 and 4 y/o watch it every morning…We record it on our DVR. Watching it again has been bitter sweet because I remember singing all those songs with my boy and now, I get to do it all over again!!! You and Ron are amazing contributors to our children ,..tanky, tanky!! Thank you Amy! Time is passing in a whirl isn’t it! My children keep accusing me of not wanting them to grow up. It isn’t that I don’t want them to be wonderful adults — I just miss each moment that has passed. So, I’m making every effort to enjoy them in the moment. We know how soon it will be over. Enjoy your little girls, as well as your big ol’ 16 year old. When my nephews were little boys they loved to watch Gullah Gullah and so did I. Now I have a 16 month old son and a 5 month old daughter and they love to watch the show. Even though it’s on from 4 to 5am every morning they will wake up just to watch it. Since my son Brennan has been watching Gullah he has begun to dance around the house and tries to mimic the same moves. I just wanted to let you know that I am so happy my children will get to experience Gullah and learn many things the way my nephews did when they were young. God bless to you and your family!